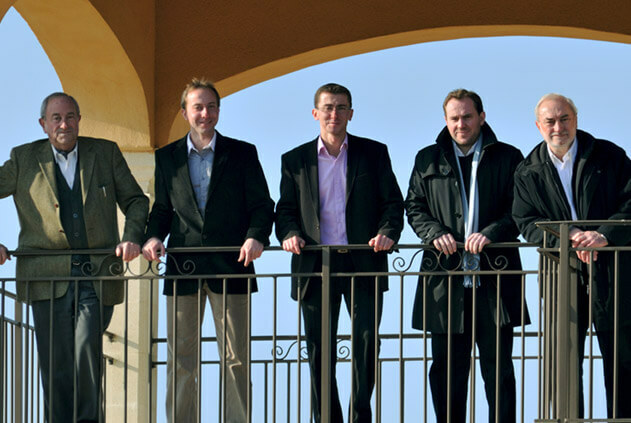 Powered with the same passion for delicate and deep wines, our family looks forward to producing red and white Rhone valley appellations focusing on elegance, finesse and balance which do express all together specificities of our soils and climate through our know-how. 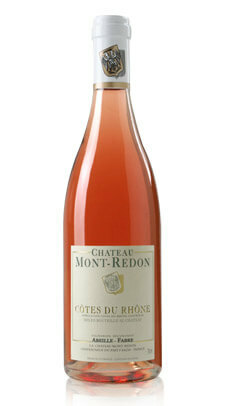 The first vines found at Mont-Redon date back to Roman times. They were planted at the bottom of the hill, sheltered from the Mistral wind, that gave its name to the Mont-Redon property. We produce wines from three appellations in the southern Rhône valley: Châteauneuf-du-Pape, Lirac and Côtes du Rhône. Thirteen grape varieties (white and red) can be used to make a Châteauneuf-du-Pape wine. We cultivate and vinify all thirteen. 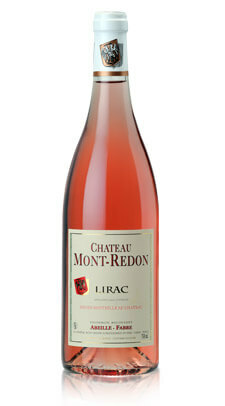 The Lirac and Côtes du Rhône are made with two, three or four varieties. Grenache (red or white) is the predominant grape in all blends. Such a large and high quality palette of grapes allows us to create subtle relationships between them, always in the goal of producing wines that are perfectly harmonious and balanced, with great complexity. These blends are the reflection of our terroir and of our own personality. The king of all southern Rhône grapes, Grenache has incredible aromatic potential. Producing a velvety sensation when tasting and giving a wine a powerful background structure. 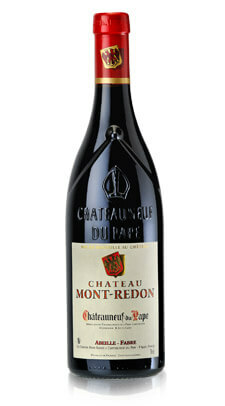 Châteauneuf-du-Pape’s terroir is ideal for this variety, with its peppery, spicy aromas. 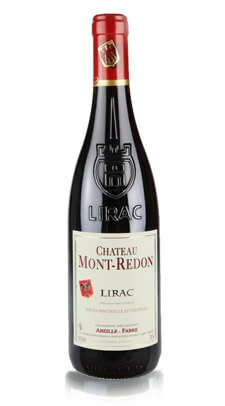 With great aromatic complexity on its side (blackcurrant, blackberry, blueberry, violets…). Complementary to Grenache, it provides, apart from its aromas, more intense colour and better defined structure. Freshness and floral notes are always welcome. We add them to our Châteauneuf-du-Pape wines. Also worthy of interest, Mourvèdre brings its wild and spicy aromas that evolve into leather and animal notes. A precious partner for Grenache, reinforcing its structure and complexity. Cinsault adds finesse and elegance, showing off floral aromas. 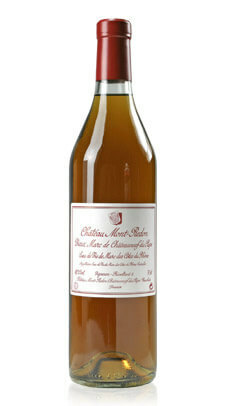 It is used in our rosé wines and in some of our reds. 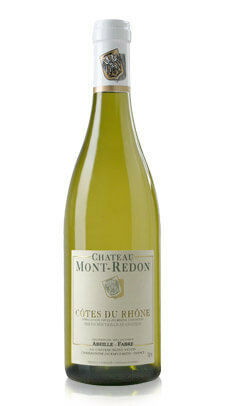 White Rhône wines often owe their floral character and freshness to this grape. It plays a dominant role in our Lirac and embellishes our Châteauneuf-du-Pape. 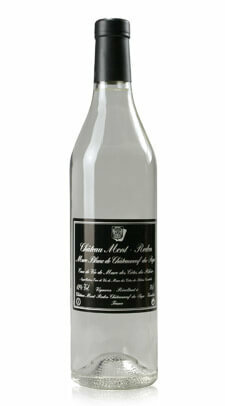 Known for its superb roundness and its aromas of pitted fruit (apricot) and violet. 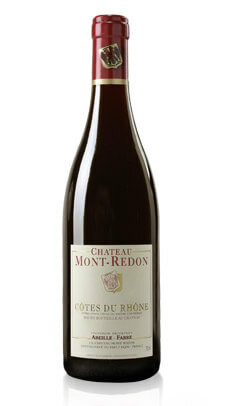 It shows itself so well when coming from Château Mont-Redon’s more southern terroirs that it has its very own Côtes du Rhône cuvée. The white variety bestows roundness and length on a wine. It happily expresses itself in our Châteauneuf-du-Pape, Lirac, and Côtes du Rhône. Finesse and aromatic intensity characterise Picpoul. Its fruity and floral aromas are a part of our Châteauneuf-du-Pape. 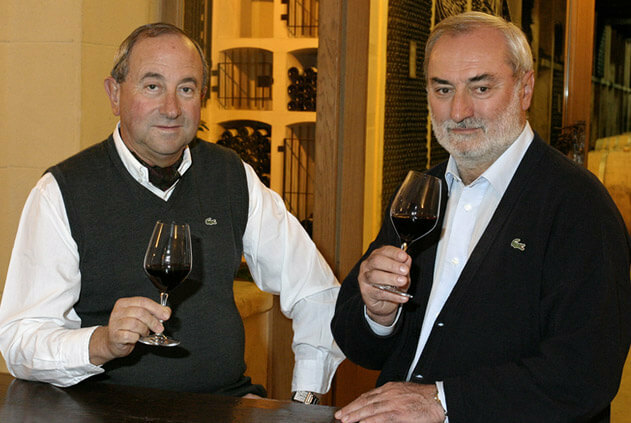 Together with the Clairette, it brings freshness and liveliness to our Châteauneuf-du-Pape and Côtes du Rhône wines. This late-ripening variety is more than welcome in our southern climate. The queen of elegance, Roussanne adorns our Châteauneuf-du-Pape and Côtes du Rhône wines with all its aromatic attractiveness: honeysuckle, narcissus, iris… Grand yet subtle! The quality of our grapes : our priority ! The Châteauneuf-du-Pape region and all around it benefit from a Mediterranean climate, characterised by summer drought and rain patterns that are never the same from one year to the next. Usually July is the driest month, and October the wettest. 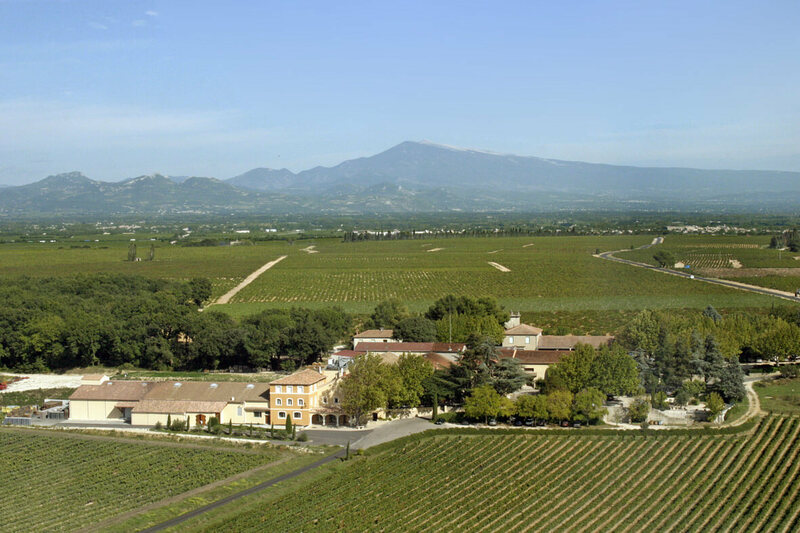 The Châteauneuf-du-Pape region is a sunny one, with as many hours of sunshine as Los Angeles (2800 hours per year). The heat that builds up during the day is reflected back onto the vines at night by the galets roulés (pudding stones), encouraging early ripening. Provence is a region of sunshine, thanks in large part to the great wind of prodigious strength: the Mistral. It can blow at speeds of up to 100 km/h at any time of the day or year. Clouds are blown aside to unmask the beautiful blue sky behind, and the sun very rarely fights with fog or mist. The wind also cleans the vineyards, keeping them free of mildew and other diseases. Châteauneuf-du-Pape a unique Geology in the World. During the Miocene period, the oceans withdrew and the continents started to become visible. In the eroded Alp mountains, rocky boulders broke off valley walls, creating a layer of stones that cracked their way down to the south, producing the Rhône’s ancient river bed. In the Venaissin County, where Châteauneuf-du-Pape is located, the Astienne Sea’s waters were shallow and the heaviest rocks (alpine quartzite) resisted the currents pulling them out to sea. Rolled about by the river, they were spread out over the appellation’s highest plains. In some places, they create a layer that can be up to two metres deep, underneath which is a strip of red clay that regulates the amount of water reaching a vine. In this first type of soil, Grenache, Syrah and Mourvèdre produce wines that are generous, powerful, tannic and concentrated. A rift in the highest part of Châteauneuf-du-Pape shifted the river’s course to three kilometres below its original path, bringing with it the smallest parts of the soil, which broke into smaller pieces still, creating sand. This second type of soil increases the aromatic character of Syrah, Cinsault and Mourvèdre. The last zone of urgonian limestone is a result of the bedrock being eroded by the weather. Soils here are shallower and give excellent results with our white varieties, rich with aromas of white and citrus fruits. Soil types: Of varying depths and varying stoniness, the soil is mainly made up of large round quartz stones mixed with sandy red clay. Climate : This is the driest region of the Côtes du Rhône; the prevailing wind is the Mistral and there are approximately 2,800 hours of sunshine per year, the heat of the day is stored by stones and released at night. Separated from Châteauneuf-du-Pape by the river, Lirac is one of the crus in the Rhône valley that can produce all three colours: red, rosé and white. Characteristic soils are made up of terraces covered in “galets roulés”, the pudding stone more commonly associated with Châteauneuf-du-Pape, a result of the miniature landslides that occur on the slopes. Grape varieties grown here show their typical characteristics. Area under cultivation : 661 hectares, yearly production: 19861 hl; average yield: 32hl/hectare. Climate : Typically Mediterranean with low rainfall, with an average of 2,700 hours of sunshine per year with the Mistral as the prevailing wind. Around the towns of Orange and Roquemaure, our Côtes du Rhône vines are planted on stony, limestone-clay plains. The generous sun encourages the grapes to reveal all their best qualities on these terroirs. Area under cultivation: 41220 hectares and 4500 wine makers make the Regional Côtes du Rhône one of the leading A.O.C. red wine producers in the Provence Alpes Côtes d’Azur and Languedoc Roussillon region. Average yield: 45hl/ha. Soils The soil is the result of a climatic and vegetal interaction stretching over thousands of year. Moreover, the strong presence of the Rhône has left its mark throughout the sedimentary basin, carving out hills and vales, bearing with it the alluvial deposits that have created a complex and varied landscape that extends from Vienne to Avignon, and from Cévennes to the foothilles of the Alps. Climate : The typically Mediterranean climate is held in the sway of the mistral, that great and forceful wind that is borne out of variations in atmospheric pressure between Northern and Southern climes, and which is so vital and beneficial to the growth of the wine. The region’s climate is a heady blend of seasons that bring each in their turn, heavy rainfall, extremely high temperatures and log intervals of exceptional sunshine. The proper management of waste has been one of our priorities for the past 10 years. We built our own purifying station and all waste (from the vineyards, the cellar and the Château itself) is treated biologically before being drained on a bed of reeds. 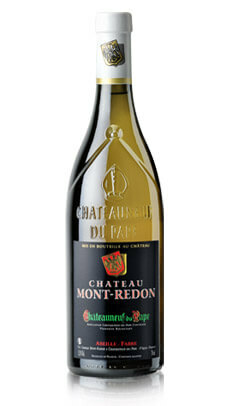 Château Mont-Redon was one of the first domaines to both treat its waste and recycle. 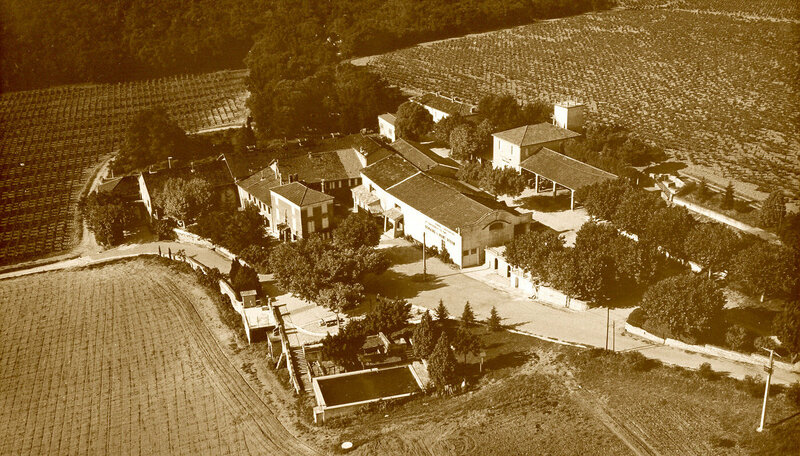 Regarding our buildings, we have enlarged our vinification cellars of red wines by adding eight additional tanks with pushing down equipments and for the white wines, we have also created a new cellar. These two cellars are around 8 metres underground. 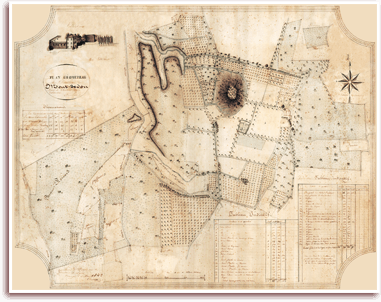 We have taken into account the ecological aspect and have integrated the appropriate materials to the building of these new cellars; moreover, we have also taken up again a subterranean passage that our grand-father had created to drain water from the plateau to feed our wells. 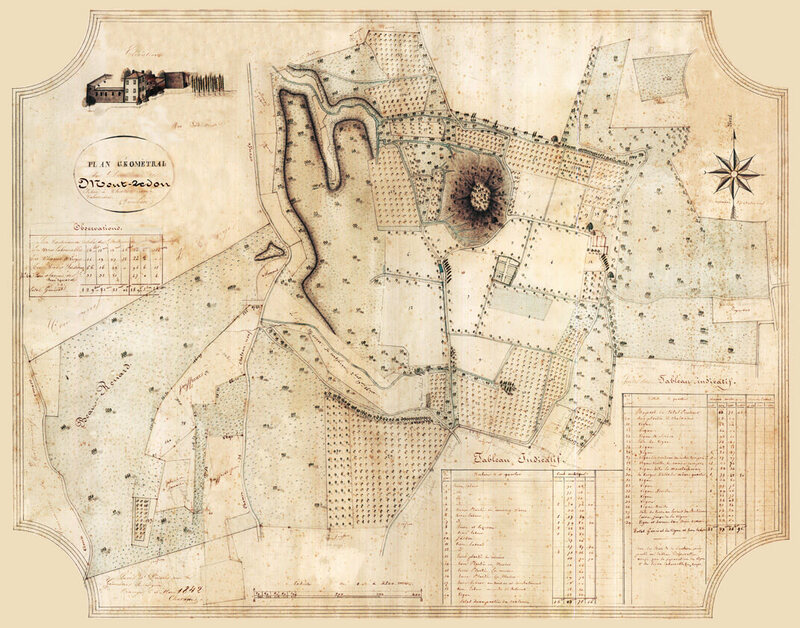 So we have extended it of about fifteen metres under the existing buildings in order to connect it with the open air, thus allowing an in-draught which will naturally air-condition our cellars as the temperature at 7 metres depth, is constantly 11°C, in summer as well as in winter. With this true Canadian well, we will be able to operate the natural air conditioning of the underground cellars we have created. Harvesting is done manually. Grapes are sorted on the vine and transported quickly to our cellars. Our primary objective is to respect and protect our raw material throughout its journey to the fermentation tank. For red wines, all bunches are destemmed to avoid extracting tannins that are too astringent or harsh, found in the stems themselves. Red grapes are harvested when physiological ripeness, the balance between sugars and acidity, has been reached. Phenolic maturity, specific to red grapes, is also sought after as it guarantees high quality tannins. We aim for both kinds of ripeness when we pick, meaning that harvesting can last over a period of 12 to 14 days. Grapes are vinified in tanks equipped with four cylinders that punch down the solid part of the must into the liquid part. This pigeage technique extracts the finest tannins from the skins. In its modern form, it automates the work that our ancestors used to do with their feet. Fermentation temperatures are recorded regularly and kept at between 28°C. Once alcoholic fermentation has finished, wines are sorted based on tasting; their grouping is confirmed by laboratory analysis after two or three weeks. Malolactic fermentation follows. One quarter of our barrels are replaced every year. 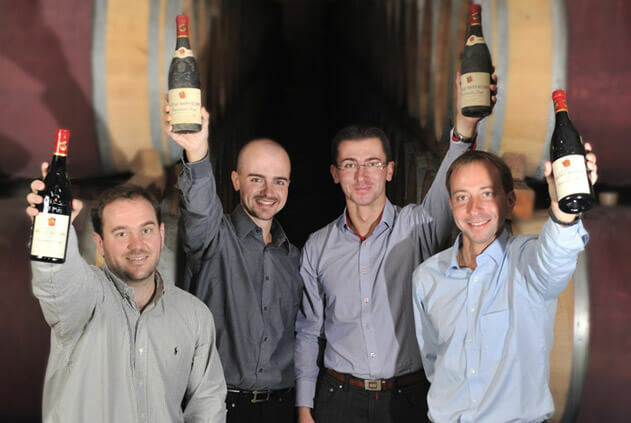 About half of the total Châteauneuf-du-Pape volume is aged in barrel for twelve months, and between 35 and 40% of the total Lirac volume ages in barrel for ten months. Wines are then blended and are left to settle for at least another three months before being bottled. Each grape variety is harvested at perfect maturity, requiring several passes through the vineyard, thus explaining the round and very aromatic character of our wines. After delicate pressing and natural settling at cold temperatures, vinification occurs at cool temperatures (16°C) to bring out the aromas specific to each grape. To keep the wines’ natural acidity (low in our climate), which provides our white wines with freshness and balance, no malolactic fermentation takes place. We age our Châteauneuf-du-Pape and Côtes du Rhône white wines on their lees in tank to emphasise their aromas and roundness. 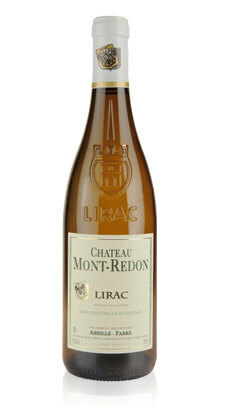 Only a third of white Lirac ferments and ages in barrel for five or six months, during which time the lees are stirred. Bottling occurs in the spring, for maximum freshness and fruit. In the upper part of these cellars, we have built a new modern, compact and efficient grapes reception room using the latest sorting technology such as optical sorting in addition to the hand sorting of the pickers in the vineyard. This technology implies to have perfectly round intact berries which led us to buy vibrating hoppers instead of our former screw driving ones, less triturating the fruit. The grapes are then gently brought up to brand-new more efficient destemmers by conveyor a belt. We also bought a new optical sorting made by two Italian companies PROTEC and DEFRANCESCHI. It is the first prototype settled in the Rhône Valley. After draining the free run juice and accurate desteming, the berries are spread thanks to another vibrating table on an horizontal conveyor belt that gives them a high constant speed. Knowing the trajectory of the berries, the computer selects the non-desired items such as petioles, pieces of leaves or stems thanks to the cameras and expulses them by shooting them by means of air valves. The good berries are then brought to the tank through an efficient pipes system. We have wide choice of sorting parameters and can adapt them at any moment according to the grape variety (white or red) or to the parcel. This machine crafted for Mont-Redon can reach a 10 ton per hour flow out. This very modern technology uses cameras linked to a computer that pictures the berries. A software sorts then the berries according to their shape, size and colour. The main component of terroir, soil has to stay healthy and balanced to ensure a vine’s good health and long life. We work our land carefully, turning it four or five times a year to aerate it without disrupting its natural structure and to encourage the vines to grow their roots deep into the soil.Keeping a close watch on the soil means we can maintain the level of organic matter that is best adapted to each of our parcels. If we need to, we add compost (sheep manure) to encourage the livelihood of the micro lifeforms necessary for the vine’s vegetative cycle. Before replanting a vineyard, we leave it to rest for five or six years, during which time we grow cereals. When it’s time to replant, we are very careful about choosing the clone and rootstock that will provide the highest level of quality. As with any living being, the vine needs constant attention. Ever present in our vineyards, we watch over the vines’ development and their health. Our own weather station, located in the middle of the domaine, gives us up-to-the-minute, precise weather information throughout the day. We take our time to physically work in the vines, pulling off extra buds and leaves throughout the Château’s vineyard area. When vines are young, we regulate the amount that is produced by green harvesting. Each of these tasks ensures that the bunches left on the vine benefit from good air circulation and are protected from disease risks. We commercialise our wines worldwide, in more than forty countries. To send us a message, please fill out the form below. You will receive an answer shortly. 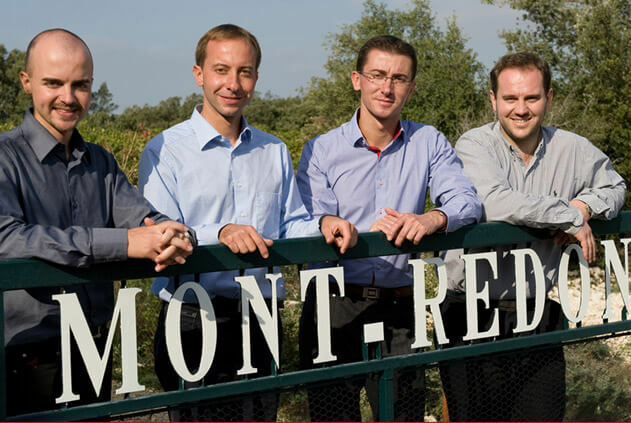 We have been cultivating the Mont-Redon vineyard for four generations now, with most respect for its unique «terroir ». Week-ends from January to February : contact us. -From October to March : 8.00 am to 7.00 pm during the week (*), 10.00 am to 6.00 pm during week-ends and bank-holidays. (*) Except on Wednesday : 8.00 am to 12.00 am and 2.00 pm to 6.00 pm.